Diffraction-limited circularly polarized electromagnetic radiation has been widely used in the literature for various applications at both optical and microwave frequencies. With advances in nanotechnology, emerging plasmonic nano-optical applications, such as all-optical magnetic recording, require circularly polarized electromagnetic radiation beyond the diffraction limit. In this study, a plasmonic cross-dipole nano-antenna is investigated to obtain a circularly polarized near-field optical spot with a size smaller than the diffraction limit of light. A cross-dipole nano-antenna is composed of four metallic nano-rods placed at a perpendicular orientation with respect to each other. The performance of the nano-antenna is investigated through numerical simulations. In the first part of this study, the nano-antenna is illuminated with a diffraction-limited circularly polarized radiation. An optimal antenna geometry is specified to obtain an intense optical spot that satisfies two necessary conditions for circular polarization: a phase difference of 90° and a unit amplitude ratio between the electric field components in the vicinity of the antenna gap. In the second part of this study, the nano-antenna is illuminated with diffraction-limited linearly polarized radiation. It is shown that the phase difference between the electric field components can be adjusted by selecting either different antenna lengths or different gap distances in the vertical and horizontal directions. Due to the relatively short wavelength of surface plasma waves on the antenna, it is demonstrated that the phase difference can be sufficient to obtain circularly polarized light. 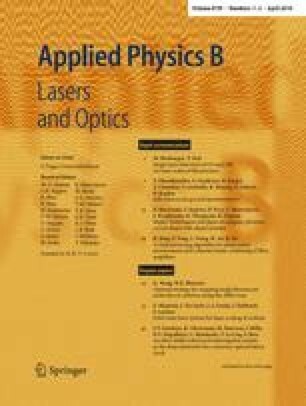 An optimal physical configuration for the nano-antenna and the polarization angle of the incident light is identified to obtain a circularly polarized optical spot beyond the diffraction limit from diffraction-limited linearly polarized radiation.